We have a Google Map on our website with a map that will guide you to your destination. The Post Code of the cottages is NE66 3EJ and they are the first two houses in Boatman's Place. As you drive through High Newton and come over the hill into Newton by the Sea, hopefully, weather permitting, as you crest the rise you will see laid out before you the majesty of Newton Bay with Dunstanburgh Castle in the distance. Towards the bottom of the hill on your right is Boatman's Place. Haven Cottage is the first cottage on your left and just beyond it is Cullernose Cottage. Just park your car outside the cottage. Your keys are held by Glynn and Yvonne who live at 6 Boatman's Place and they are your contact in the unlikely case that you encounter a problem whilst on holiday. Glynn's number is 01665 576894 should you wish to phone just prior to your arrival or whilst on holiday. Please do not arrive before 4.00 pm, unless by prior arrangement, as your cottage may not be ready. We ask that you depart by 10am, as it is a Herculean task to get everything ready by 4.00 pm and we need all the time available! The questions we are most asked by new visitors before they arrive. We provide bed linen, tea towels, bath and hand towels. Please bring swimming towels. There is a Morrisons and Sainsburys in Alnwick which are open until 8.00 pm every day and between 10.00 am and 4.00 pm on Sundays. We are constantly adding helpful information to our website, so do look prior to your holiday to see if there is anything there that may be of use. There are excellent opportunities for walking in Northumberland and we have lists of walks throughout the area in the cottage. There are excellent beach walks to the south and north of Newton by the Sea... just walk out the door and down the hill onto the beach and chose your direction! Guided Hill walks throughout the county can be arranged through Jon Monks at www.shepherdswalks.co.uk and there are also guided walks most weekends organized by the Northumberland National Parks and the walks can be found at www.northumberland.gov.uk/discover. 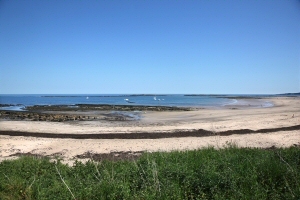 Northumberland is renowned for its wonderful beaches and you are fortunate to be within 100 yards of one of the best stretches of this amazing coastline. Embleton Bay around the point at the end of Newton beach towards Dunstanburgh Castle was voted the Best Beach in England by the National Trust a year a two ago and it is my very favourite of all Northumberland's beaches. Alnmouth to the south is a super coastal village with a very accessible beach. Bamburgh Beach to the north is spectacular with the huge Norman Castle towering over miles of golden sands. The beaches are fabulous at all times of year and there are many noted walks incorporating many of them. There are a wide ranch of courses available, both links and parkland. Dunstanburgh Castle Golf Course is behind the next bay. This is a true links course designed by James Braid the designer of the Augusta National where the Masters is help every year. Bamburgh is a fabulous holiday course with stunning views. Foxton Hall is a coastal parkland course at Alnmouth with a Georgian clubhouse and great facilities, including buggy hire for the less nimble! Cragside and Wallington Hall which are two National Trust flagship properties in the county and Belsay Hall has England's finest quarry garden. Lindisfarne Castle is a spectacular miniature castle in an unrivalled position on Holy Island... only approachable at low tide. Bamburgh Castle is in private hands but is open to the public and is well worth a visit. Northumberland is well and truly on the map for garden tourists with many fine gardens. The current favourite for many is the famous Alnwick Garden. However, there are many other fantastic gardens all over the county and in my view most of these eclipse Alnwick and always will. Herterton, Howick, Belsay and Wallington are just a few mature gardens that are popular with visitors and within easy reach. Many visitors to Newton have rarely been to Scotland and many visitors enjoy a trip to the wonderful Scottish Borders. It is interesting to visit the Abbeys of Kelso, Jedburgh, Melrose and Dryburgh on a day trip or Border mansions such as Floors Castle, Manderstone, Mellerstain or Abbotsford. Alnwick is an excellent local market town with a wide range of specialist shops. This is an affluent area, and you can see that when you go to Alnwick. There is a wide range of excellent specialist shops, including a delicatessen and two supermarkets.